Police officers from Summit, Eagle, Lake and Clear Creek counties attended a training session last week put on by District Attorney Bruce Brown. 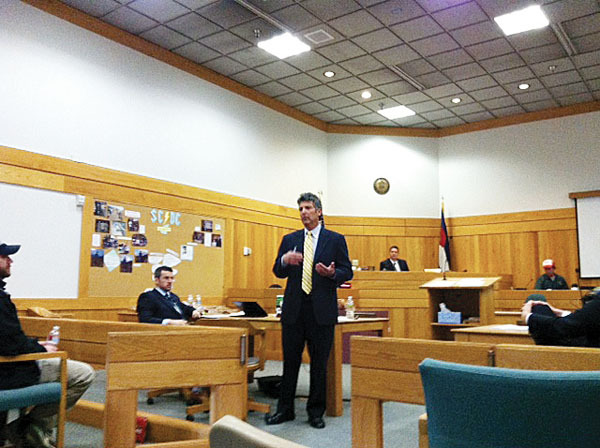 The training, which took place April 10, was designed for police agencies within the Fifth Judicial District. The purpose of the training was to familiarize officers, particularly those new on the job, with courtroom procedures. “Law enforcement officers are often called on to testify in court hearings and trials and need to be aware of court procedures, legal requirements and their responsibilities,” Brown said in a news release. About 30 officers attended the training, including representatives from the Breckenridge, Silverthorne and Frisco police departments, the Summit County Sheriff’s Office and the Colorado State Patrol. The idea for the training arose from discussions between Brown and the various police chiefs around the time that Brown was running for office, according to Silverthorne police chief Mark Hanschmidt. While previously the district attorney might catch an officer to prepare him or her shortly before entering the courtroom, Hanschmidt and the others hoped that more might be done. Hanschmidt attended Brown’s training along with five officers from the Silverthorne department. He was pleased with what he saw. The training included reviewing common actions of law enforcement, like creating a report or record that can be observed on paper during case reviews. The training also covered the meaning behind various attorney objections and what effect those have after a judge has made a ruling. Officers practiced writing and presenting reports, and sitting on the witness stand and being examined by the prosecutor. Summit County Sheriff John Minor, who also attended, said that he, too, appreciated the real-life aspect of the training, which could apply to new and experienced officers alike. Both Minor and Hanschmidt said that a good relationship and strong connection with the district attorney’s office is important. Minor and Hanschmidt said that while the recent training went well and addressed the important issues, they would be interested in similar training events in the future. Currently, Brown’s office has scheduled additional trainings in the coming weeks for officers in Eagle County.